Many bosses steer clear of play at work, and my managers have warned me many times to chill out, but I can’t. I love to laugh! Some benefits of laughter are the reduction in stress hormones, strengthening of the immune system, promotion of creativity, and exercise for your heart and abdomen. According to a study at Villanova, laughing 100 times is the equivalent of ten minutes on the rowing machine or fifteen minutes on an exercise bike! 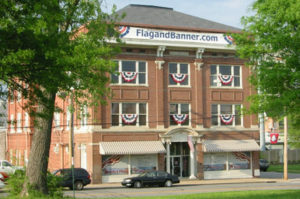 Playing is an important part of the FlagandBanner.com culture. I don’t want to spend 40 hours a week at something I don’t enjoy, and I don’t expect others to, either. Keeping with that philosophy, when someone applies for a job, they are warned of our playfulness and asked if they can take a joke. If the candidate goes so far as to tell one, they’re hired! My employee and mentor, Charles Fisher, was the biggest prankster of all. 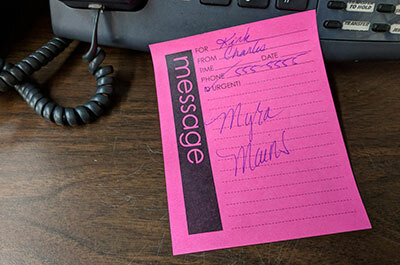 Decades ago he started this sales floor indoctrination: Someone hands the new salesman a pink “return call” slip and says, “This lady called and wants you to call her back.” The lady’s name on the paper is ‘Myra Mains’ and the phone number is a funeral home. As our rookie salesperson makes the call, his co-workers huddle in the corner, trying to contain themselves until the prank is over and then burst into laughter. It works every time! The best part of the joke is the endorphins last all day. I like to think of us as a bunch of responsible, playful, American rebels working in a historically-significant, non-traditional building with round windows that look like the port holes of a pirate ship, and our booty is patriotism. Fun and Flags for all!